Infoaboutkids.org is an ongoing collaboration of the Consortium for Science-Based Information on Children, Youth and Families. Our goal is to promote healthy child and family development by highlighting science-based information for those who care for, or work with, children. Our site, updated quarterly, links to other well-established, trustworthy websites for parents, other caregivers, and professionals. Our monthly blogs will summarize science-based information on timely topics. Information provided on the site is meant to complement and not replace any advice or information from a health or education professional. 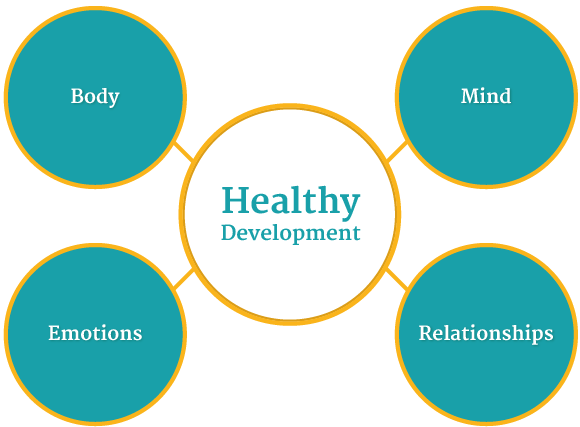 How does healthy child and adolescent physical development occur? This section looks at physical milestones from birth through adolescence, including puberty. Topics related to healthy development, including healthy eating, exercise and activity levels, and doctor visits are available. Also included are areas that may be of concern, such as specific health conditions, drug abuse, and pain management. How do children think and learn? This section looks at milestones in thinking, understanding, problem solving, and language. School topics such as homework and test anxiety are included. This section also includes challenges such as Intellectual disabilities and learning problems. How are emotions understood and managed by children and adolescents? This section looks at milestones in developing emotional well-being. This also includes information about challenges to emotional well-being such as conflict, stress, and trauma. Specific mental and behavioral health conditions are also included. How can children and adolescents relate with others effectively? This section looks at how healthy relationships are developed with family members, peers, and with others in the schools and community. This also includes challenges that happen within the family such as conflict, in schools such as bullying, or in the community such as involvement with the legal system.